The ADS850 is a high dynamic range, 14-bit Analog-to-digital Converter (ADC) that utilizes a fully differential input, allowing for either single-ended or differential input Interface over varying input spans. This converter features digital error correction techniques ensuring 14-bit linearity and a calibration procedure that corrects for capacitor and gain mismatches. The ADS850 also includes a high-bandwidth track-and-hold that provides excellent spurious performance up to and beyond the Nyquist rate. The ADS850 provides an internal reference that CAN be programmed for a 2Vp-p input range for the best spurious performance and ease of driving. Alternatively, the 4Vp-p input range CAN be used for the lowest input referred noise, offering superior signal-to-noise performance for imaging applications. There is also the capability to set the range between 2Vp-p and 4Vp-p, or to use an external reference. The ADS850 also provides an over-range indicator flag to indicate if the input has exceeded the full-scale input range of the converter. The low distortion and high signal-to-noise performance provide the extra margin needed for Communications imaging, and test instrumentation applications. The ADS850 is available in a TQFP-48 package. 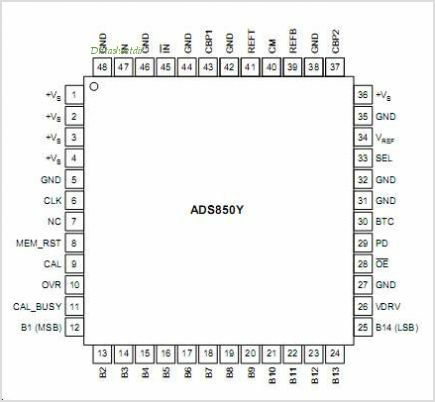 This is one package pinout of ADS850,If you need more pinouts please download ADS850's pdf datasheet. This is one application circuit of ADS850,If you need more circuits,please download ADS850's pdf datasheet.